The last word in luxury lifestyle is at your fingertips. 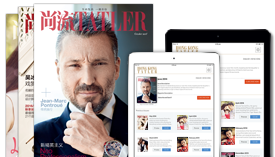 Subscribe now and experience 尚流 Tatler the way you want. View 尚流 Tatler Magazine on paper at its best printing quality. Auto-deliver to your mailbox every month. Download the digital version from your favourite distribution channel, even before print version hit the shelves. View the magazine in your iPhone / iPad's Newsstand. View the magazine with our dellcated Android App. View the magazine using the Magzter App/website. For both iOS and Android devices. View the magazine using the Zinio App/website. View the magazine using the PressReader App/website. For iOS, Android, Windows, Blackberry and Kindle devices.